Joe Bonamassa picked up a guitar at age four, could cop SRV and Hendrix licks note-for-note by age seven, and was discovered by B.B. King while still in his pre-teens. The following content is related to the August 2013 issue of Guitar World. For the full range of interviews, features, tabs and more, pick up the new issue on newsstands now, or in our online store. 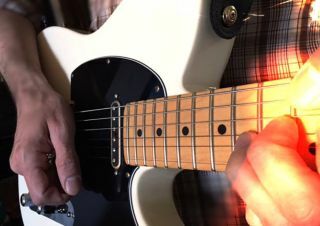 All That Jazz: How to Play "Out of the Blue"
Take Guitar World's "Raining Blood" Transcription Challenge and Compete for a Marshall 15-Watt Mini Stack Amp! Joe Bonamassa Talks 'SeeSaw,' His New Album with Beth Hart, and His Ongoing Love Affair with Gibson's Les Paul "Burst"